First, pardon me if you read this blog purely for my discussions on books and writing. The following post has absolutely nothing to do with either, but I still want to share. 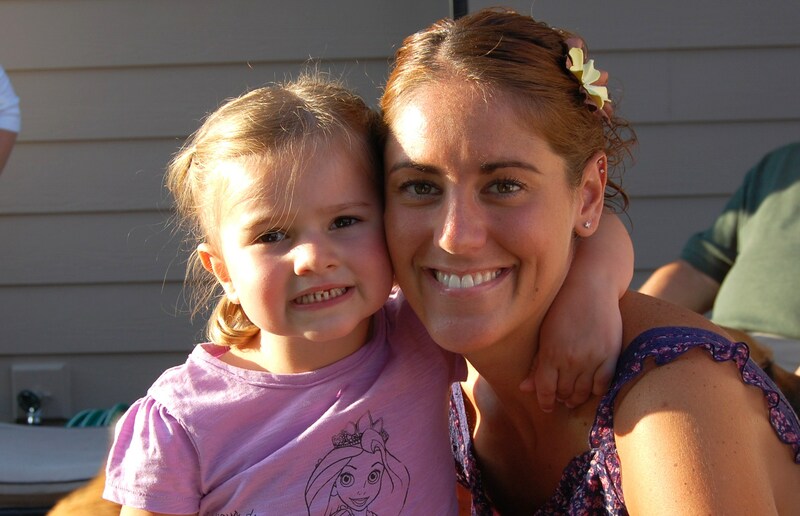 As well as being an enthusiastic writer and avid reader, I’m a mom and a lover of entertaining and all things Disney. This weekend I threw my daughter a killer fourth birthday party. The theme? Tangled, of course! I won’t bore you with dozens of pictures of my daughter eating cake and opening gifts (though she really is very cute :)), but I thought it would be fun to post a few images of the details, which (in my oh-s0-humble opinion) came together so well. 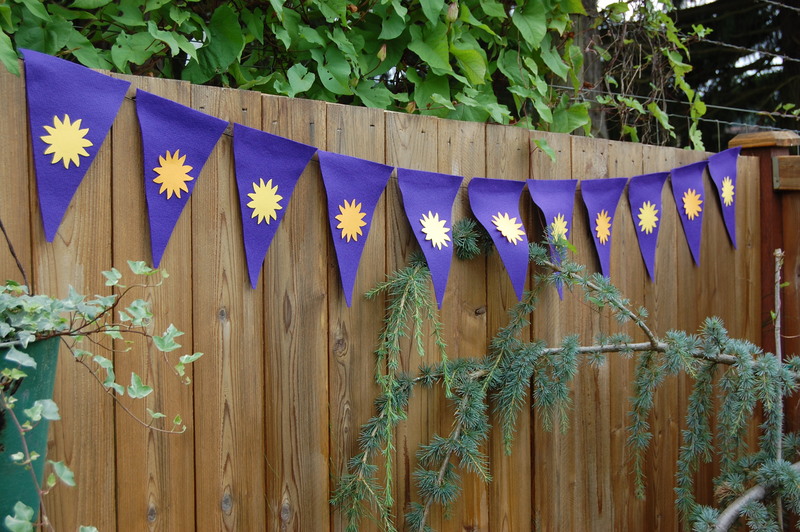 First, Kingdom Flags, which I made out of purple felt and suns die-cut from yellow card stock. I strung them all along my fence, then hung the leftovers in my daughter’s bedroom, which she LOVES. 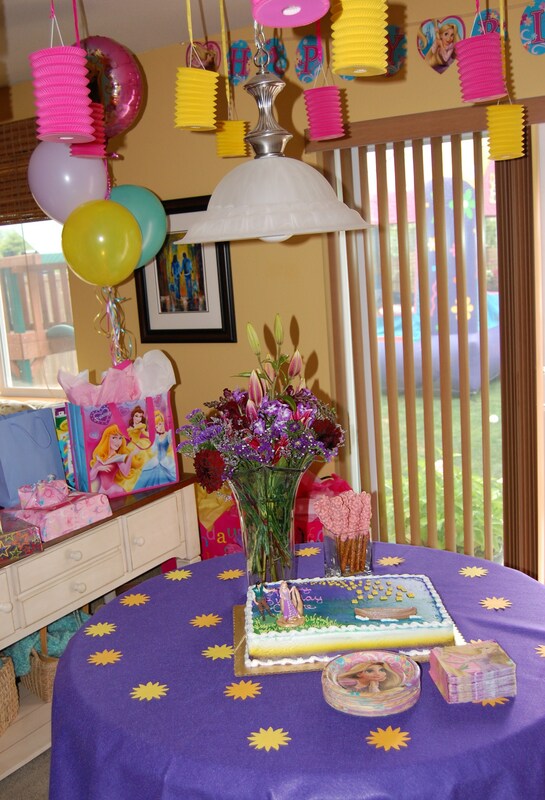 I dangled tons of “floating” lanterns from the ceiling of my kitchen and used what was left of the purple felt and suns to make a cloth for the cake table. And, gotta have lots of balloons. 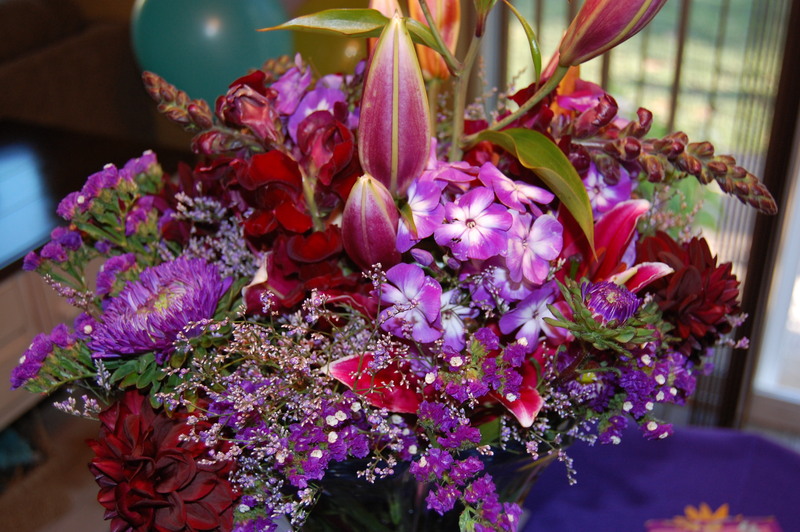 These flowers were only $10 dollars at the local Farmer’s Market. Love! 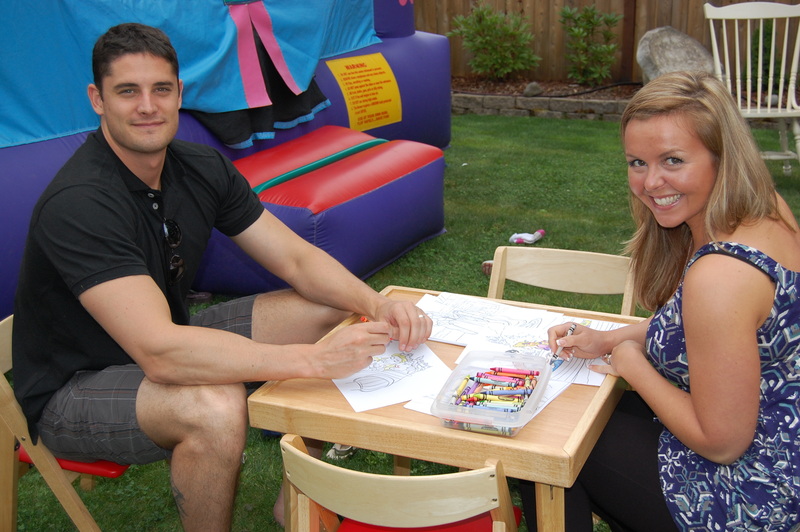 My brother and sister-in-law trying out the coloring station, where I set out Tangled coloring pages and lots of crayons. Other entertainment? Swing set, wooden play castle with Princess toys, bounce house, and paddle ball. 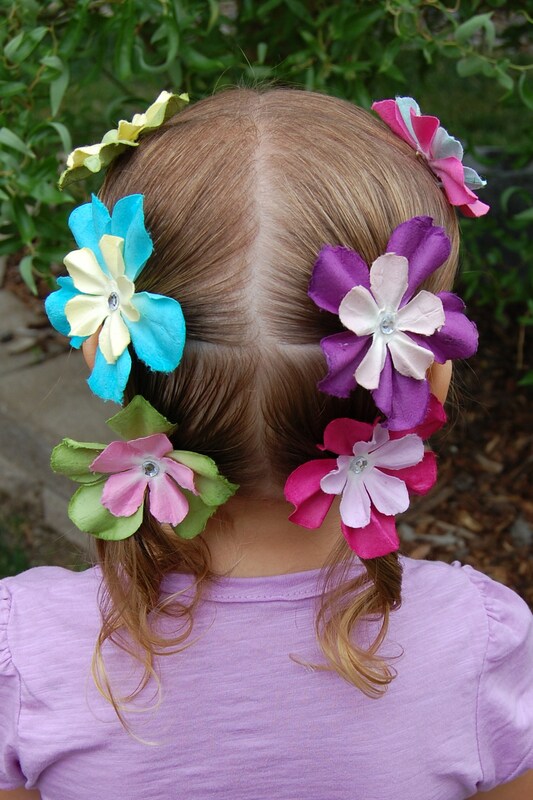 My daughter doesn’t have thick enough hair to French braid, but she still wanted to wear lots of flowers in it. I made these by doubling up paper flowers, adding jewels, and hot-gluing them to little bobby pins. I’m a fan of snacks and finger foods. 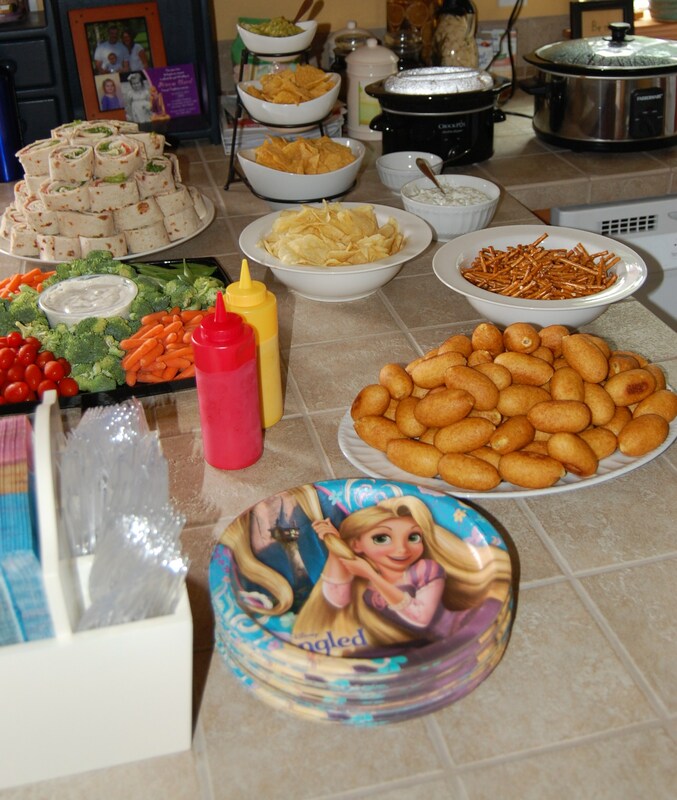 I served (healthy-ish) wraps, mini corn dogs, Swedish meatballs, veggies, and lots of chips and dips to munch on. 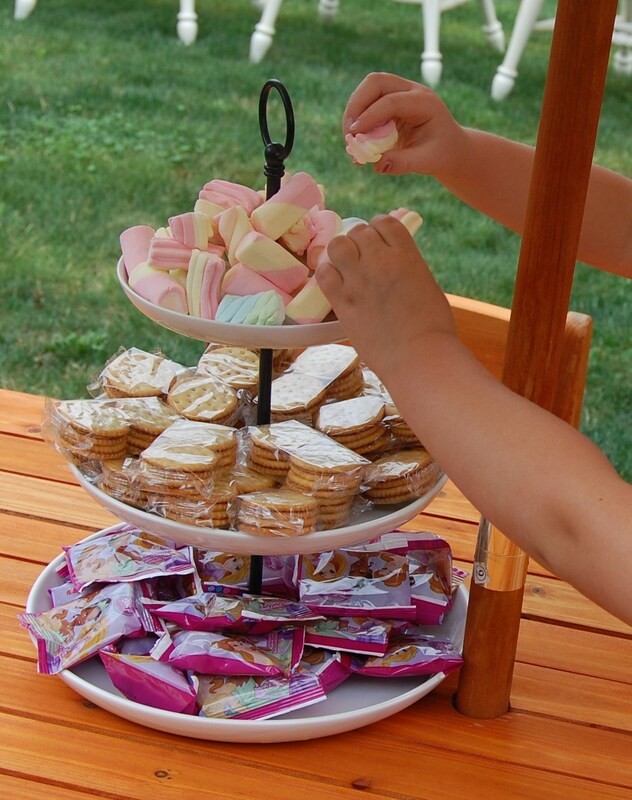 I put kid-friendly snacks outside too. Fruit snacks, peanut-butter-and-jelly crackers, and colored marshmallows (or, edible floating lanterns!). This was my vision, but definitely not my handiwork. 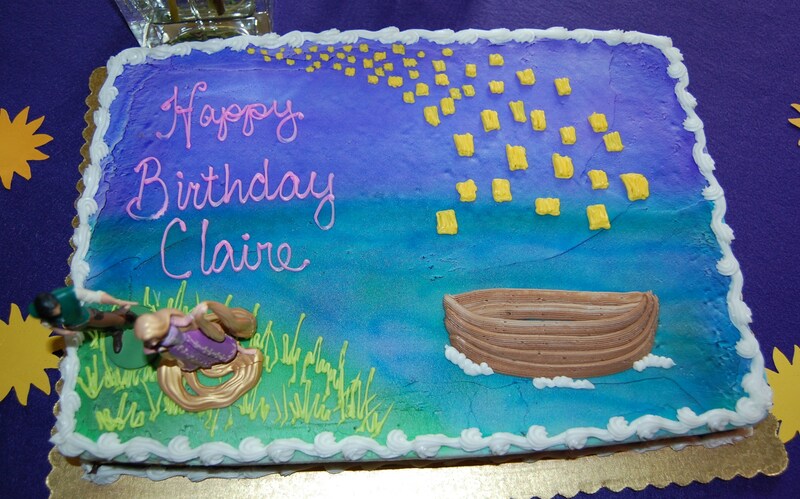 My town has the BEST bakery and they did a lovely job decorating the cake (and oh-my-gosh… was it yummy!). Though they’re hard to see, I added Rapunzel and Flynn Ryder toys to the grassy area. And, my girl and me post-party. We had so much fun! Throw any good parties lately? Any tips to share? Thanks, Erin. We definitely had a great time! I think we’re working our way up to a Princess party every year too. Last year was Tiana, this year Rapunzel, and next year we’ve already decided on Snow White. Silly girl! Holy cow, what a par-tay!!!! You did such a fab job decorating, Katy – I’m sure this is one b’day Claire won’t soon forget! And I love how you did her hair – you are so crafty!! LOVE! You did such a great job, Katy! Seriously, I’m blown away. And the flowers in Claire’s hair! Too, too cute. When I was taking Rowan to the car after our dinner last week, she looked at me and said, “Are we going to Claire’s birthday party?” Haha. I think she just wanted a piece of that yummy-looking cake! Aww… Rowan is such a doll. Hopefully we can have another girls’ date sooner rather than later! Someone deserves a prize for being a good mom. Hint: it’s you. Looks like a fun time was had by all! That looks like such a fabulous and fun party. You did such a wonderful job with it! The flowers in your daughter’s hair are the prettiest. ohmygosh – you are super mom! I love it! And I love seeing your pics! I did an American Idol party for my daughter for her eighth. That was fun. And for her eleventh I took her and five friends for pedicures. No more Disney parties though. I miss them. What a super party! We had a Tangled birthday this year, too. I bet our girls would get on well. I bet they would too. 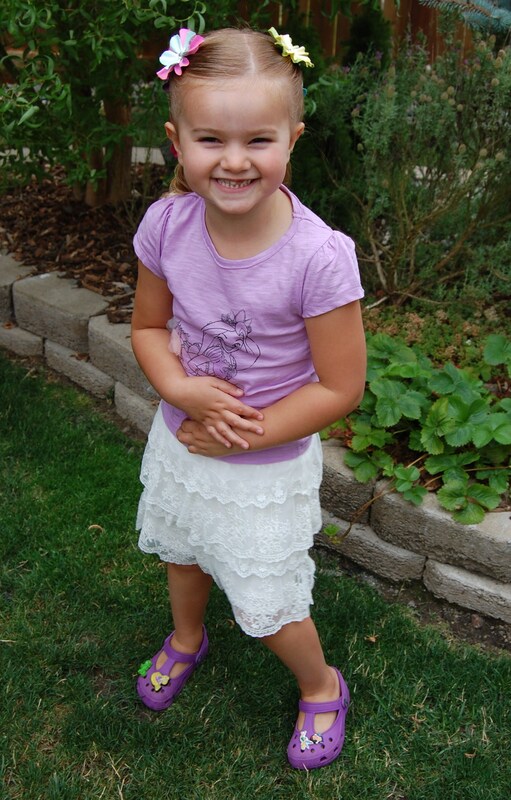 My daughter is down with anyone who finds joy in Rapunzel! so stinkin cute!! LOVE all the creative stuff. I hate when you go to a b-day and it’s just cookie-cutter stuff. This is adorable!!! Get out. Mother of the year award! Though now I’m thinking about some kind of writing retreat that has themed afternoon teas! Eek… I have NO idea what brand it was! I used an Accu-Cut Roller Die Cut Machine at a Ben Franklin store in Bonney Lake, WA, but can’t say for sure what brand the specific die was. I suppose you could call them and ask. Sorry! I wish I could be more help!